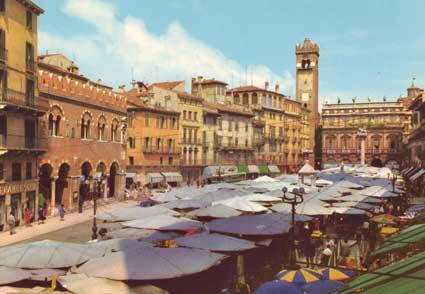 It is about 120 miles from Santa Margherita to Verona. We left at 8AM and stopped for lunch around 11:30. Our bus. It had a VCR and Eva played an interesting and informative documentary about Otzi, who we’d meet later in Bolsalmo. I was tempted, but since I had one a few days ago (that squirted custard on me), I skipped it in favor of another scavenged sandwich. Plus 2.6 Euros is a bit too steep. 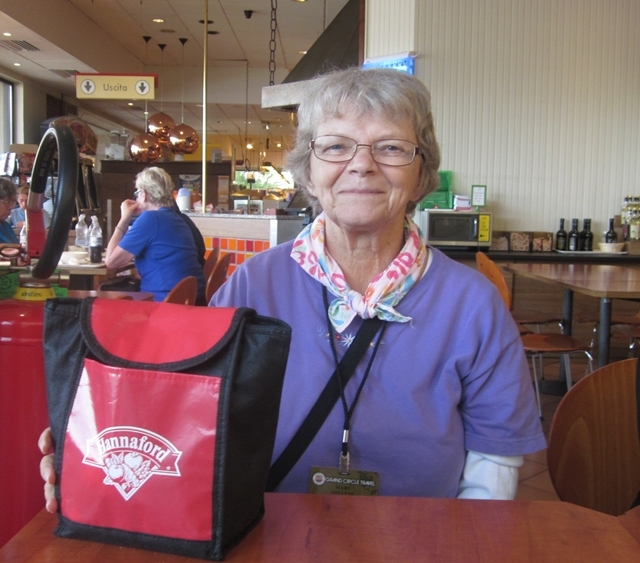 This is our handy-dandy insulated lunch bag from Hannaford’s Market in Wells, Maine. It was given to me by my good friend Bob who works there. Here is a map of downtown Verona. Note the Arena, (Number 1). It is like the Rome Colosseum. 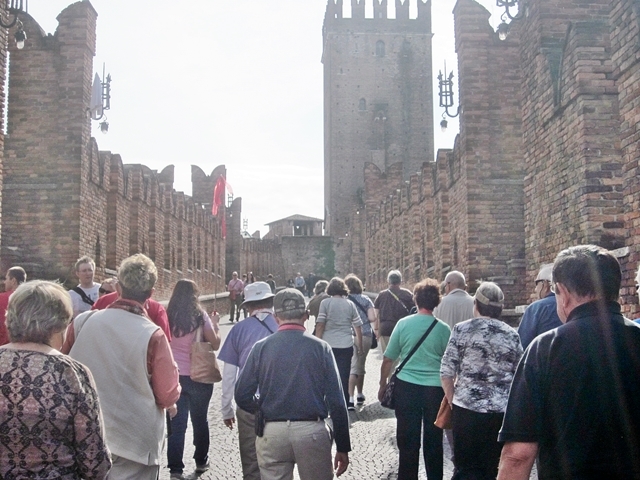 Our group got off the bus and hiked to the center of Verona over the Castel Vecchio bridge (19 on the map above). It is a fortified bridge over the Adige River. The segmental arch bridge featured the world’s largest span at the time of its construction (160 feet). The solidity of the construction allowed it to resist untouched until, in the late 18th century, the French troops destroyed the tower on the left bank. The bridge was however totally destroyed, along with the Ponte Pietra, by the retreating German troops on April 24, 1945. 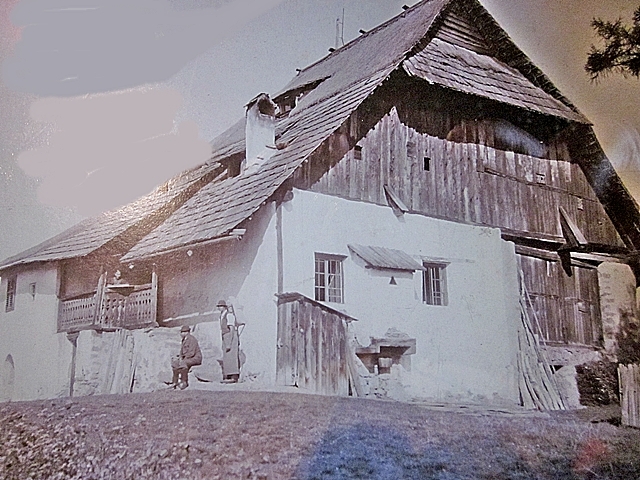 A faithful reconstruction begun in 1949 and was finished in 1951, with the exception of the left tower. We were serenaded on the bridge by this street (bridge) musician. 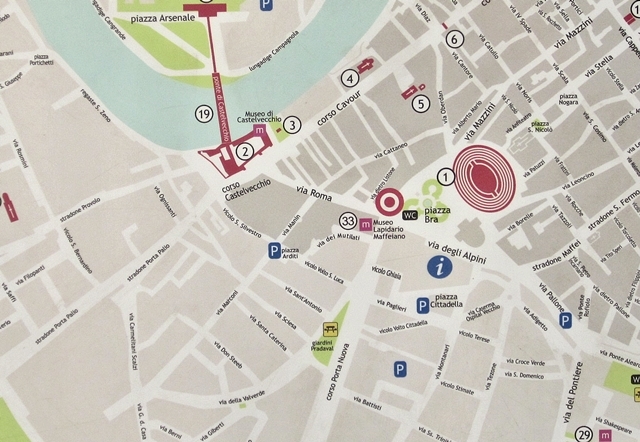 Here is our Verona City Guide: Sylvia in the main Plaza. 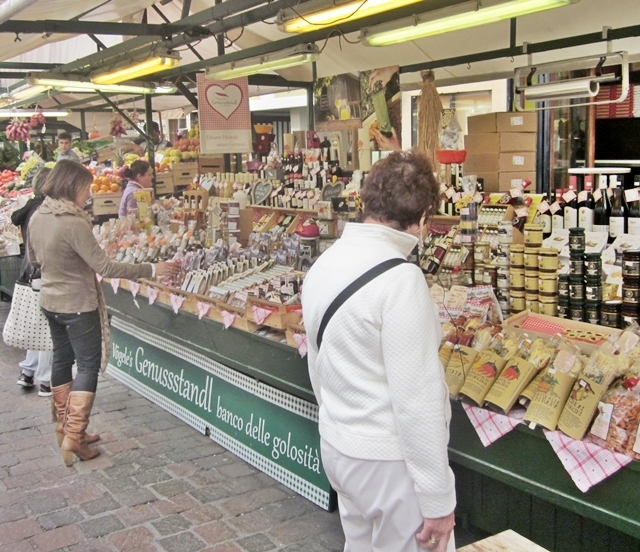 There is a lot to see in Verona and we’d be lost without her. 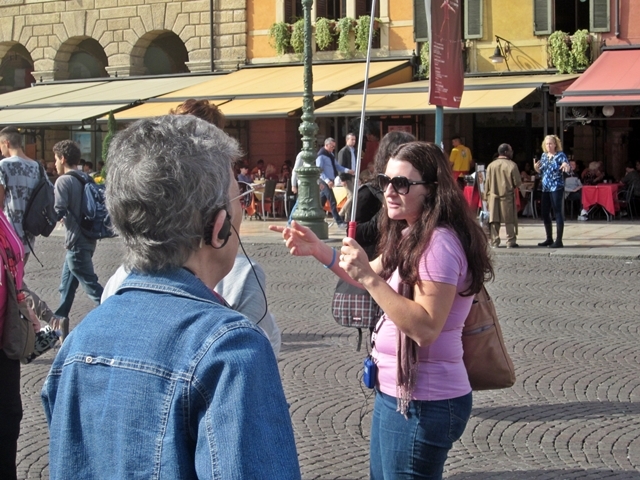 See the “Whisper” in Helen’s (from MA) ear and the flower pole Sylvia is carrying. It keeps us all together. 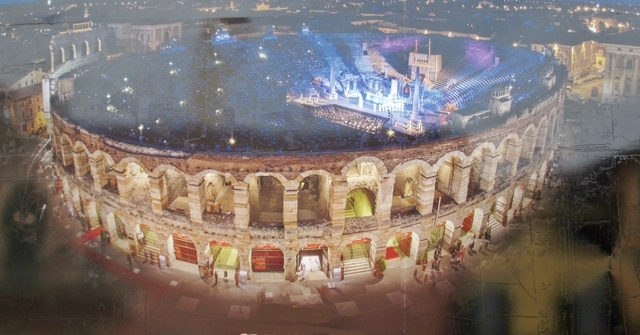 This is Verona’s Colosseum. It’s smaller than Romes and is called the “Arena” (after the sand that was on the floor). The building itself was built in AD 30 on a site which was then beyond the city walls. The shows and games staged there were so famous that spectators came from many other places, often far away, to witness them. 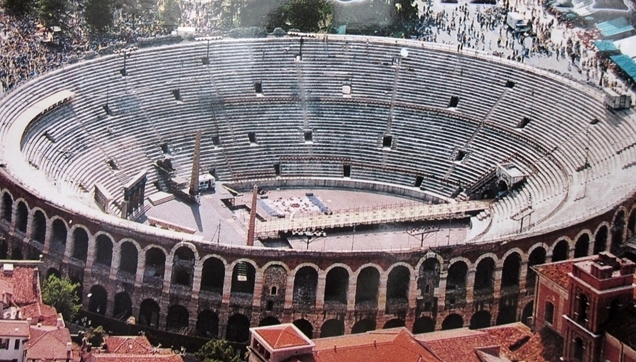 The amphitheater could host more than 30,000 spectators in ancient times (vs. approximately 70,00 Rome). This is what it looks like in the daylight. Needless to say, the Jews had an up and down history in Verona (as in all Italy and Europe). It is too lengthy and complicated to outline here. 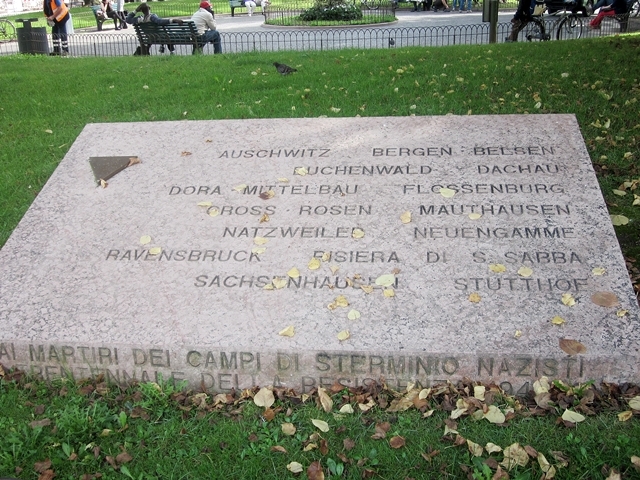 This memorial tablet in the main plaza remembers the many Nazi Death Camps that Italian Jews we sent to during the Holocaust. In the 20th century Under fascism Jews took part to set up and were permitted to join the National Fascist Party. On 28 July 1938, Pope Pius XI made a speech expressing the view that mankind is a single, large, universal human race with no room for special races, and the Alliance Israélite Universelle thanked him for that speech. The deportations of Italian Jews to Nazi death camps began after September 1943, when Italy capitulated to the Allies and, in response, the German troops invaded Italy from the North. It is estimated that 7,500 Italian Jews became victims of the Holocaust. General Kurt Malzer, Nazi chief in Rome, died in 1952. Austrian Ludwig Koch was the head of the Gestapo and the neo-Fascist Italian police in Rome and received 3 years imprisonment after the war. Here is the present day Jewish Synagogue in Verona. 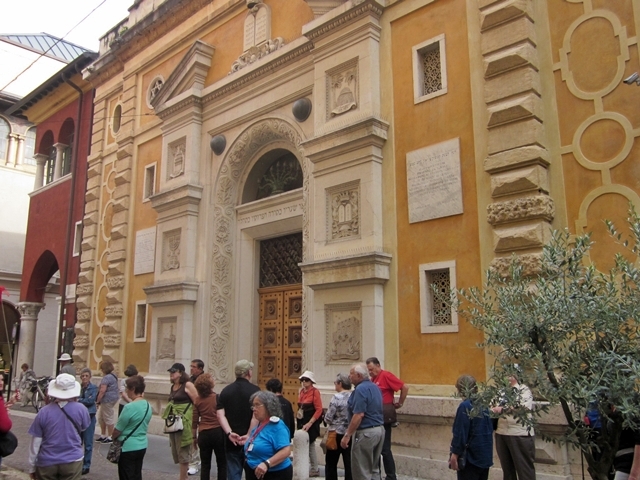 Note the Ten Commandments above the door. 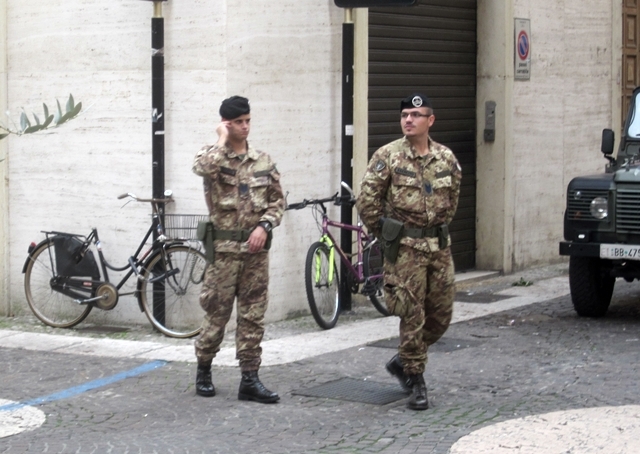 These “two gentlemen from Verona” are Italian Army soldiers. They were posted near the Synagogue. I was told it was to protect it from any terrorist that may be connected with the current Gaza/Jerusalem bombings. Let’s move on to something more pleasant. Here is Juliet’s balcony and her brass right breast. 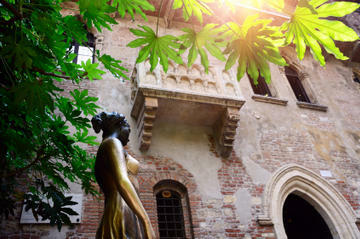 This house in Verona, known as Juliet’s house, was owned by the family dell Capello, a name not too far from Capulet, right? 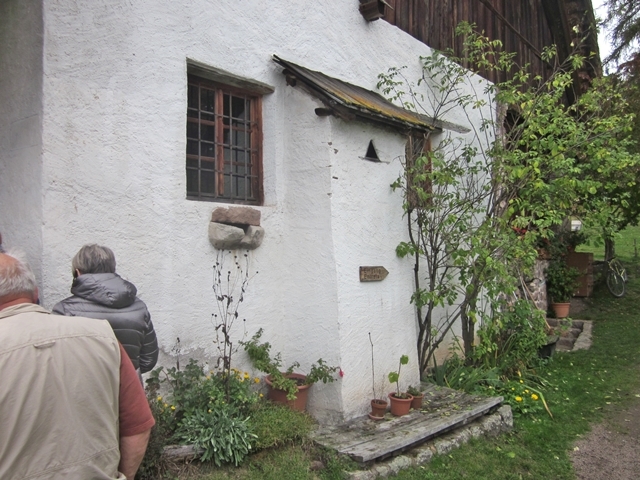 The house dates from the 13th century and the family coat of arms can still be seen on the wall. 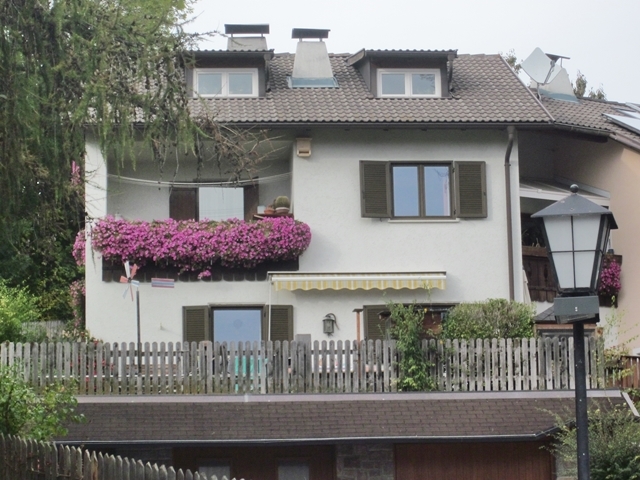 A slight problem is the balcony itself, which overlooks the courtyard – it was added in the 20th century. But that’s of no matter to the hundreds of girls who every year step out onto it and gaze below seeking their Romeo among the milling tourists. 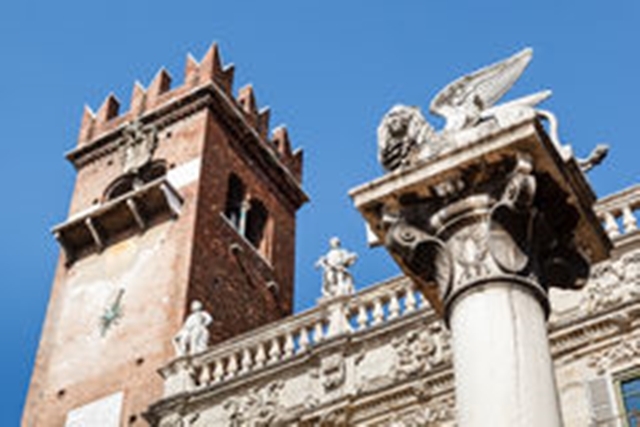 The site is one of Italy’s most popular tourist attractions, and rubbing the statue’s right breast in the hope of good luck has become tradition. Of course, the Romeo and Juliet story came from the mind of William Shakespeare and is fiction. That doesn’t bother the tourist, though. 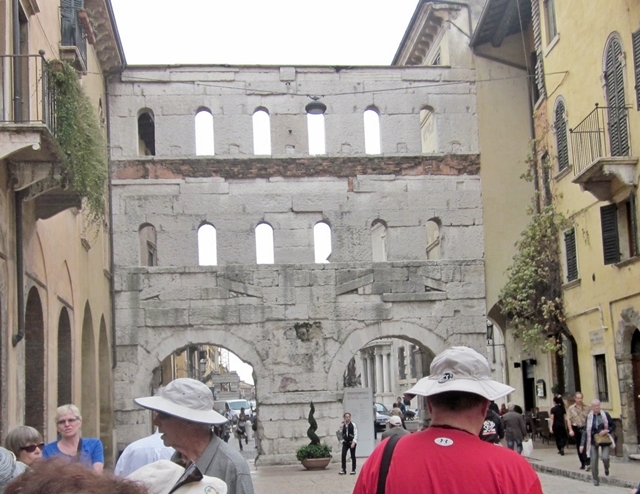 It dates to the 1st century AD, though it was most likely built over a pre-existing gate from the 1st century BC. 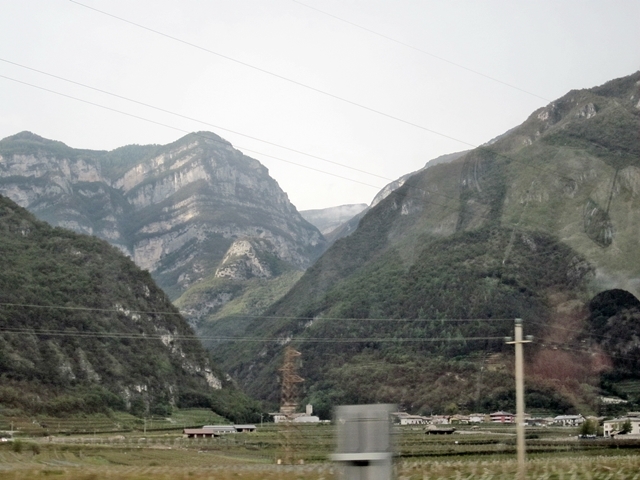 We reboarded our bus to continue north to the Italian Alps. Up to now, we’ve been mostly riding through “flat” country side. 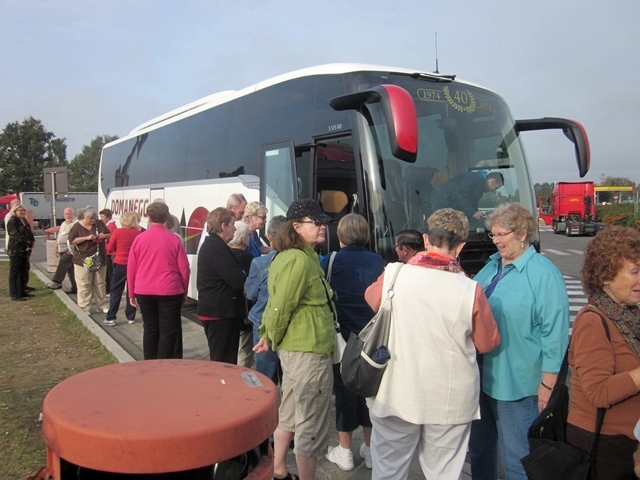 As we headed north, we began seeing mountains, vineyards, and castles. 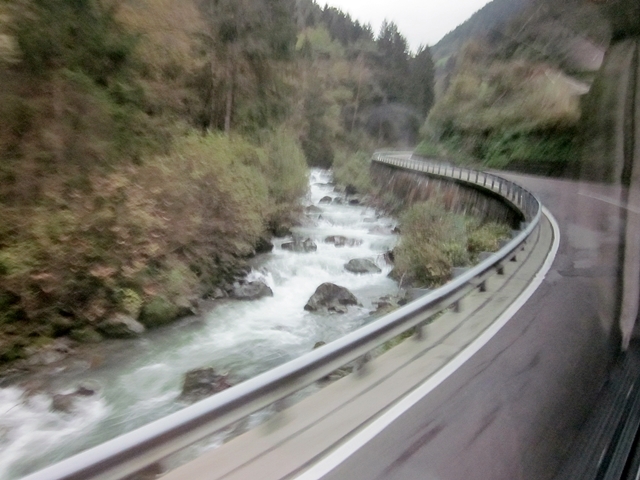 We are entering an area called the Southern Tyrol. 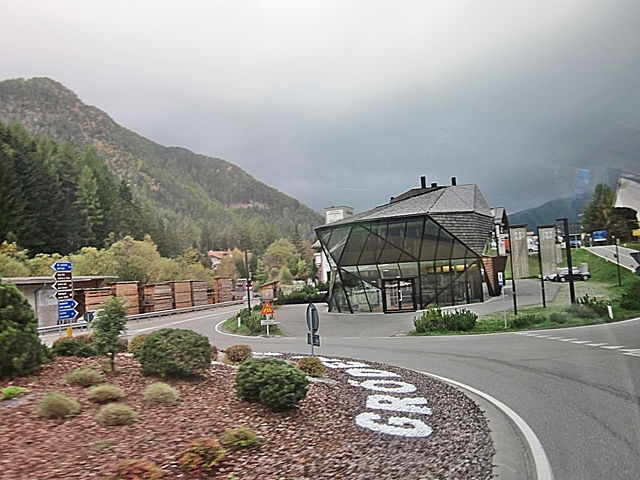 An area once owned by Austria but was annexed to Italy after WWI. Most place names are written in Italian and German. 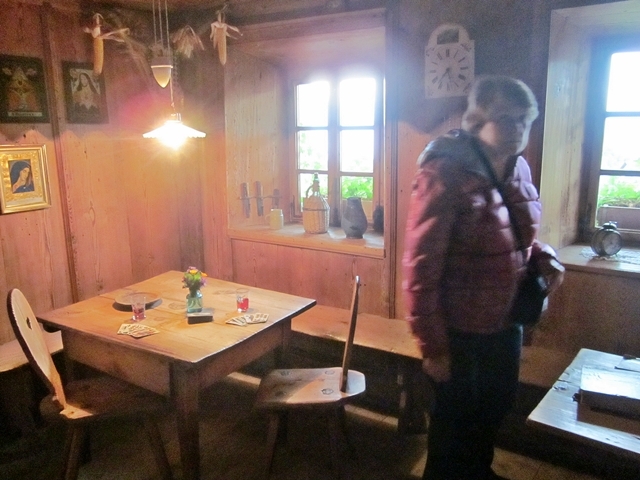 You can get a real sense of the Germanic culture here with the food and wine: Lots of meat dishes and less pasta. In the lower left is the town of Bolzano. The plateau in the center is a shoulder of the Renon Mountain. We spent a lot of time in both places. They are connected by an aerial tramway and a winding road. It’s a beautiful part of the Dolomites. 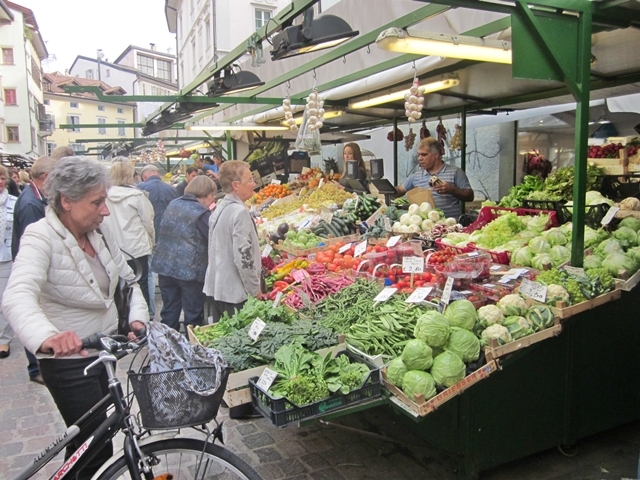 We arrived late in the afternoon, got to our hotel, took a brief tour of Bolzano center, located the nearby “Cespar” market, had dinner with the group at a local restaurant (lotsa meat), returned to the hotel, and hit the hay. 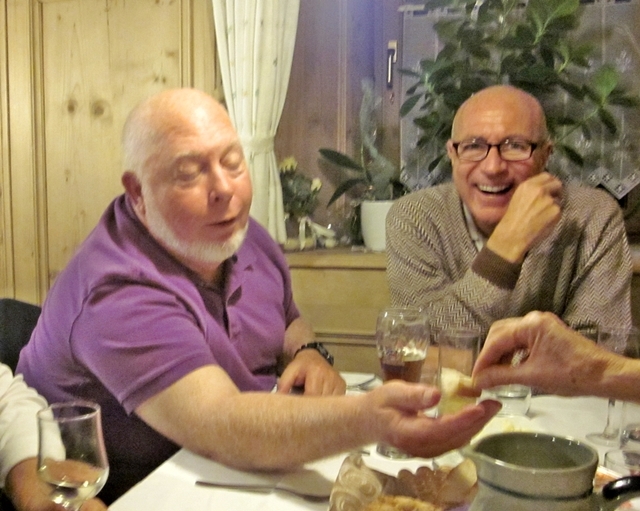 So endeth our day in Verona and our trip to Bolzano. 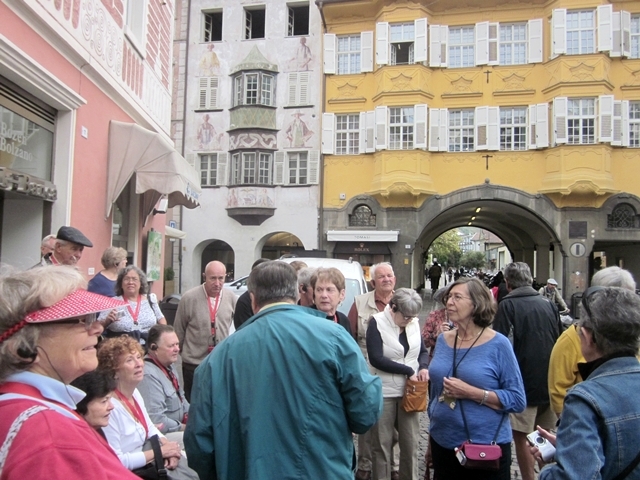 Our next day in Bolzano began with an introduction (by Eva, on the left, our Tour Director) to Luchiano, our City Guide. 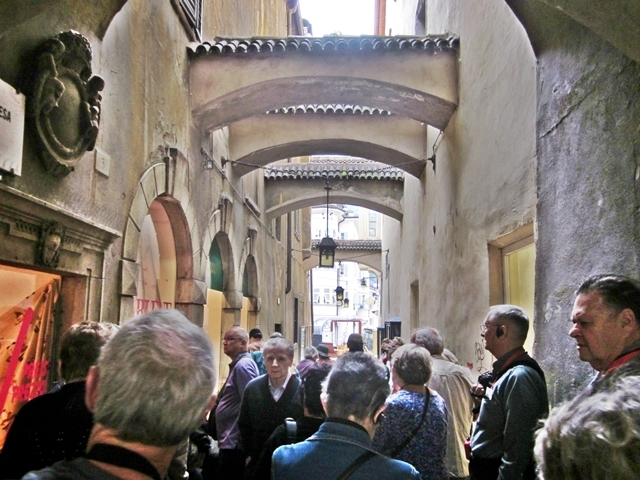 Luchiano guided us through some of the narrow medieval streets in Bolzano and describe some of the ancient buildings. Luchiano took us to the city square and told us about the history of this part of Italy and about the Austrian influences. He was informative and ad a great sense of humor. 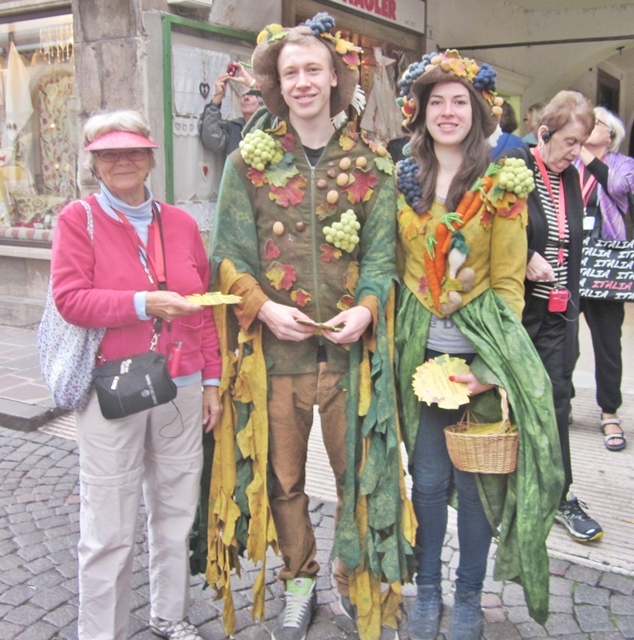 These two kids were dressed up to advertize a Thanksgiving Festival (German: Erntedankfest or Italian:Festa del Ringraziamento) that was to be held the next day.. This is the Walther Plaza. . Walther is the guy in the statue. He was Walther von der Vogelweide (c. 1170 – c. 1230) the most celebrated of the Middle High German lyric poets. 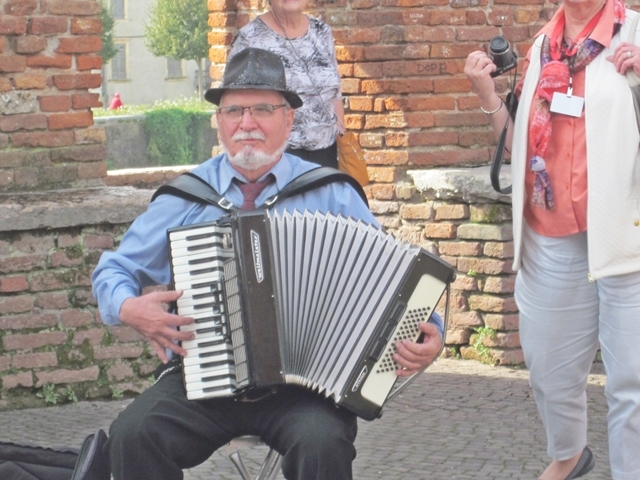 I couldn’t find out much about him, but Luchiano said the there were a lot of singing groups in Bolzano that seem to be connected to a Walther tradition. In the distance is the Duomo. The Duomo di Bolzano has splendid architecture. It is the showpiece of the town’s medieval center and main square. 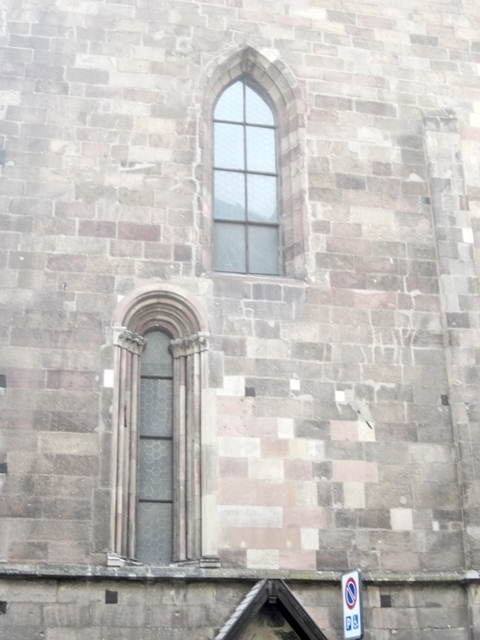 It has both Romanesque and Gothic architecture. The Gothic steeple was completed in 1517. The colorful tiles on the roof add an interesting appeal. Another big, beautiful church of Europe. 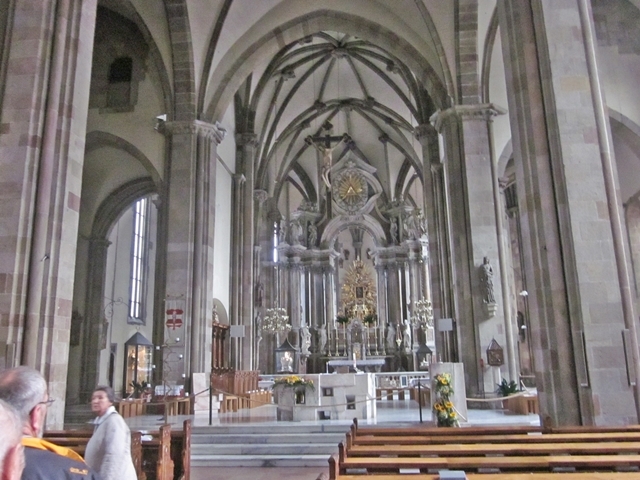 This is the interior of the Duomo. It was quite impressive. There were frescos on the walls that had been damaged. 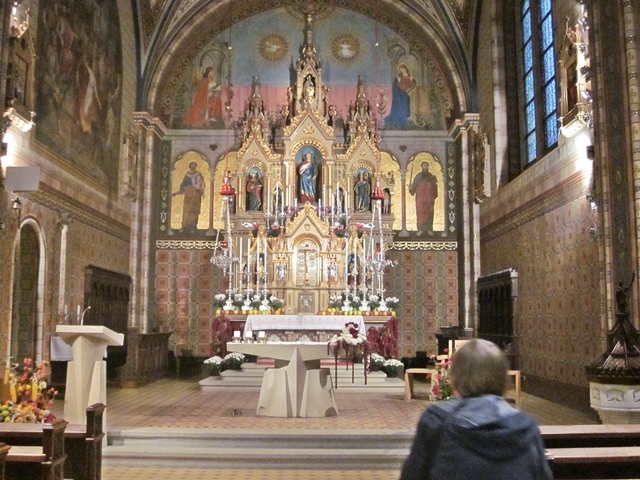 I was told that the church was almost destroyed in WWII. 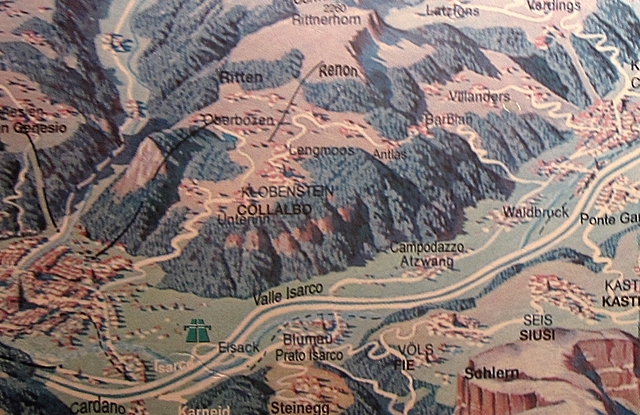 Because of Bolzano’s location, trade was a major part of the city. 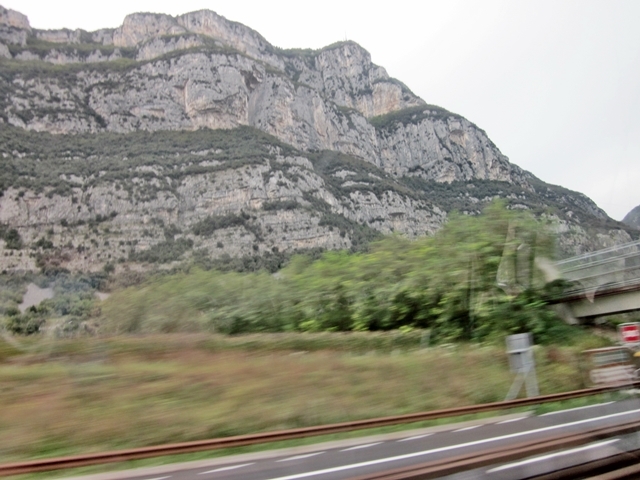 The target for bombing missions were the train marshalling yards of Bolzano as well as railroad bridges in the area. One thing I learned from Luchiano was the difference between Romanesque and Renaissance windows: Rounded windows are Romanesque, pointed are Renaissance. Both are here on the Duomo. 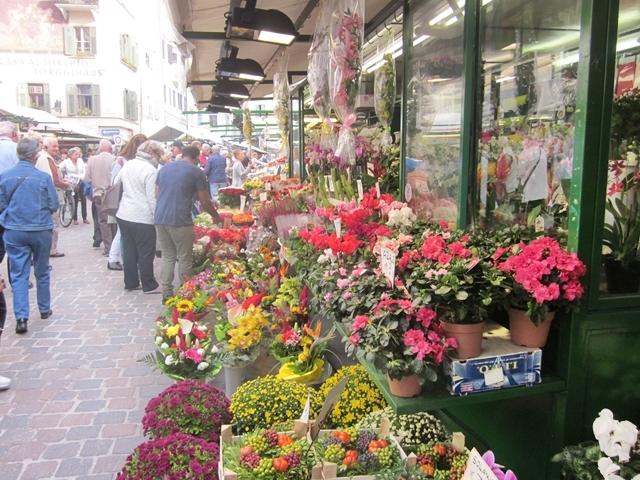 We walked past a honey and jam stall, a fruit stall, and a flower stall. They were a delight for the eyes! And, people were buying!! We finally got to the Archeology Museum. Luciano said good bye and we went in (GCT paid the admission). 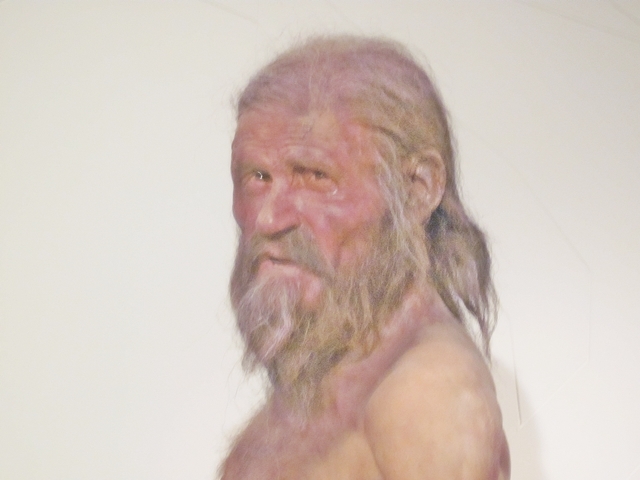 Here we met Otzi the Iceman as he looked 5300 years ago. Today he looks like this. 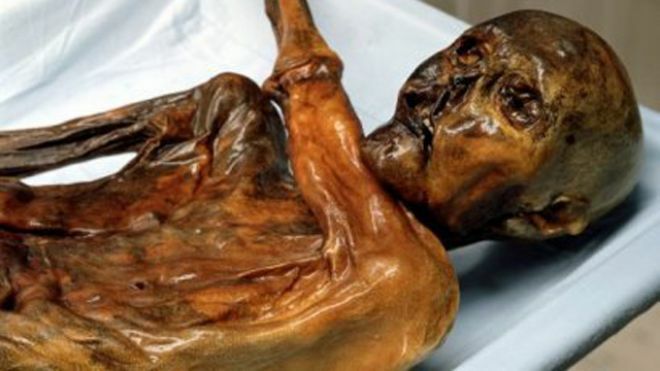 Ötzi the Iceman, the Similaun Man, is a well-preserved natural mummy of a man who lived around 3,300 BC The mummy was found in September 1991 in the Ötztal Alps, hence the nickname “Ötzi”, near the Similaun mountain and on the border between Austria and Italy. He is Europe’s oldest known natural human mummy, and has offered an unprecedented view of Copper Age Europeans. On 19 September 1991, Ötzi was found by two German tourists They believed that the body was of a recently deceased mountaineer. The next day, a mountain gendarme and the keeper of the nearby Alpine Hut first attempted to remove the body, which was frozen in ice below the torso, using a pneumatic drill and ice-axes, but had to give up due to bad weather. 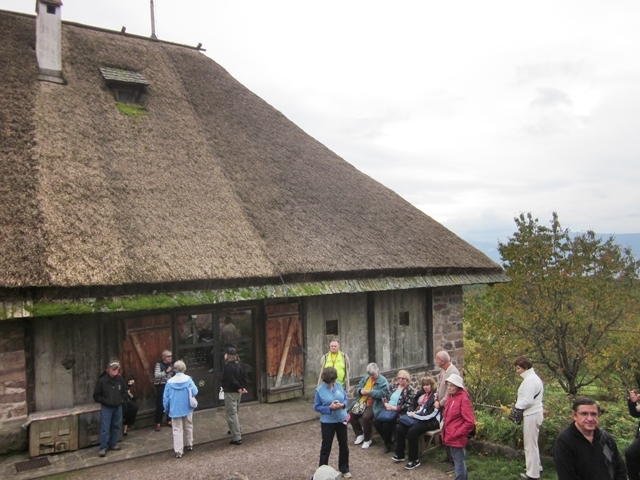 The next day, eight groups visited the site, amongst whom happened to be the famous mountaineers Hans Kammerlander and Reinhold Messner. The body was semi-officially extracted on 22 September and officially salvaged the following day. 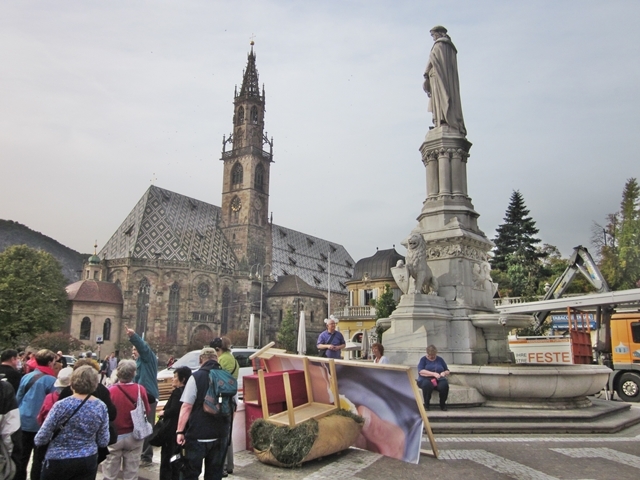 It was transported to the University of Innsbruck, where it was recognized to be primeval the same day. By current estimates, at the time of his death Ötzi was approximately 5 ft 5 in tall, weighed about 110 lbs and was about 45 years of age. When his body was found, it weighed 30.25 lbs Because the body was covered in ice shortly after his death, it had only partially deteriorated. Analysis of pollen, dust grains and the isotopic composition of his tooth enamel indicates that he spent his childhood near Bolzano, but later went to live in valleys about 30 miles farther north. Analysis of Ötzi’s intestinal contents showed two meals (the last one consumed about eight hours before his death), one of chamois meat, the other of red deer and herb bread. Both were eaten with grain as well as roots and fruits. 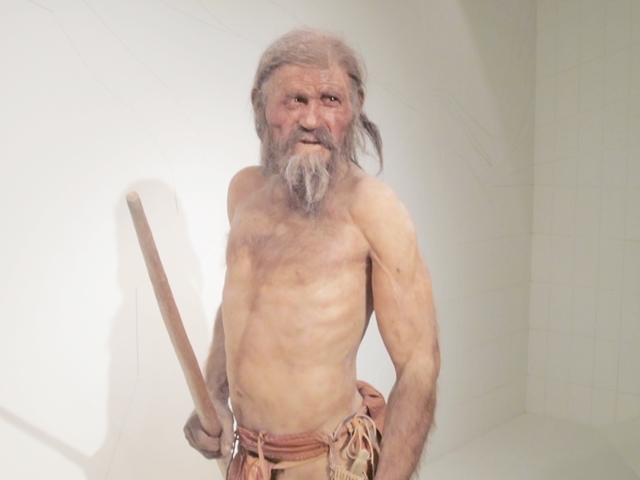 Here’s how Otzi probably looked shortly before he died. He had a waterproof cape of woven grass, a fur cap, leather shoes, and fur leggings. His equipment included: a yew bow with arrows, a copper ax, and a stone knife in a sheath. He also had a food bag and an embers bag. He was very well equiped for mountain travel. 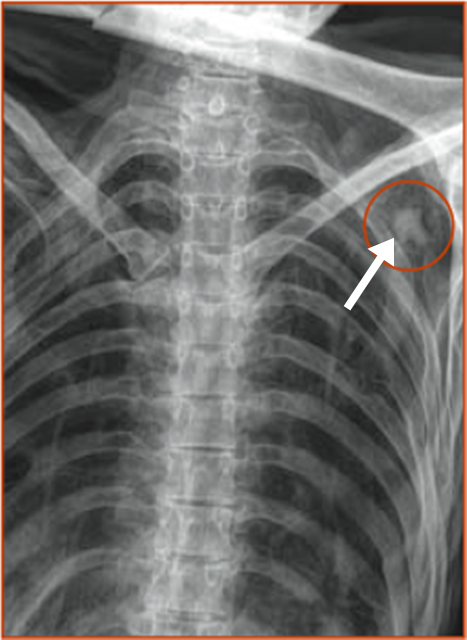 Now for the big news: In June 2001, an x-ray revealed a peculiar arrow like object lodged into Otzi’s shoulder. This object was discovered to be denser than bone and was concluded to be a stone arrow head which had not been noticed despite the ten years of intensive study. With the unexpected discovery of this arrow head, past theories have been refined to explain the presence of the arrow head which had managed to penetrate his shoulder bone. Theories now state Otzi had been chased and shot by an arrow of which he himself had extracted, or the attacker had extracted after the shot. Exhausted from energy and drained from bleeding, Otzi could not continue further and therefore lay down and froze to death. Evidence of traces of blood in Otzi’s brain also reveals the fact that Otzi had suffered head injuries prior to or after his death. 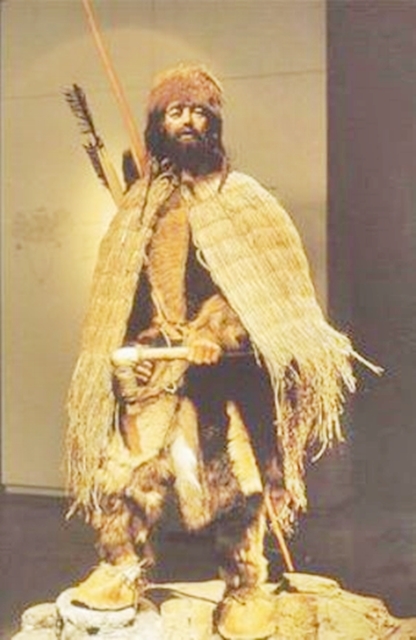 The blow to the head may have resulted in a finishing attack by the attacker or Otzi may have hit his head on a rock after falling to his death. “Now you know the rest of the story” of this fascinating man. After lunch (“on our own”) the group gathered for a walk to the Funuvia del Renon. 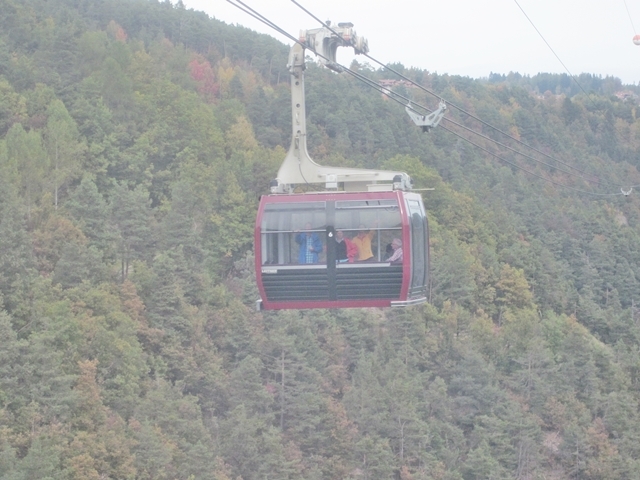 This is a cable car that connects the towns of Bolzano and Soprabolzano on a shoulder of the Renon mountain. 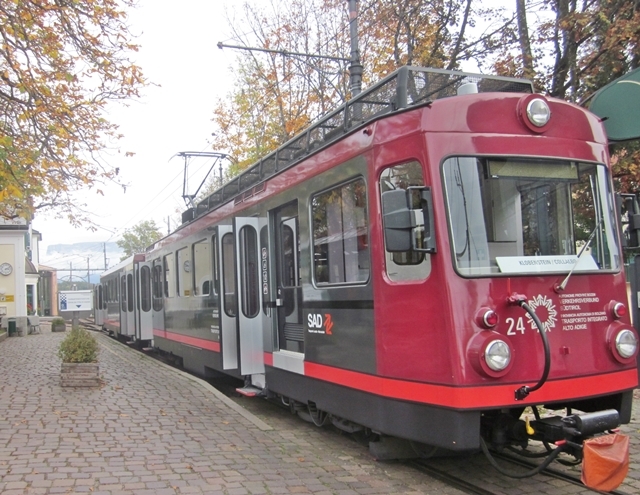 Although the cable car primarily serves the tourist market, it also provides an important transit link for the residents of Renon At the top station there is a little electric train that take you to the town of Collabo about 3.5 miles away. 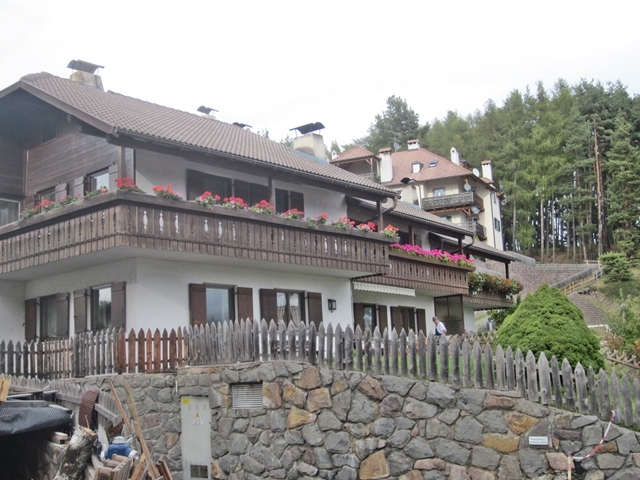 Collabo is a cutsey, alpsy town at the end of the rail line with nice views of the Dolomites. This is a poster I snapped in Collabo. 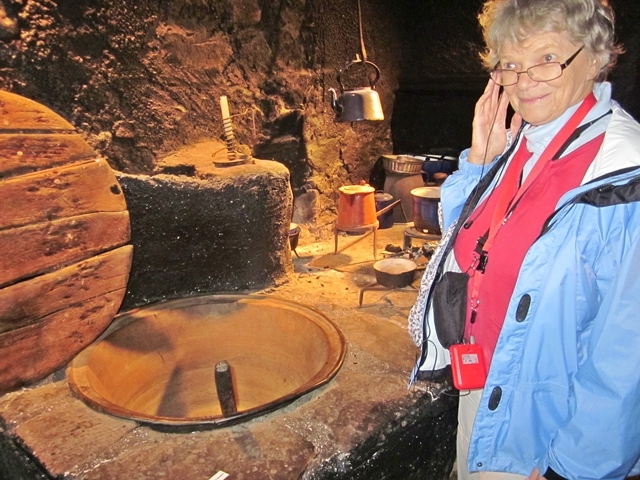 The Messner Mountain Museum is based in Sigmundskron Castle near Bolzano. He was a local boy. 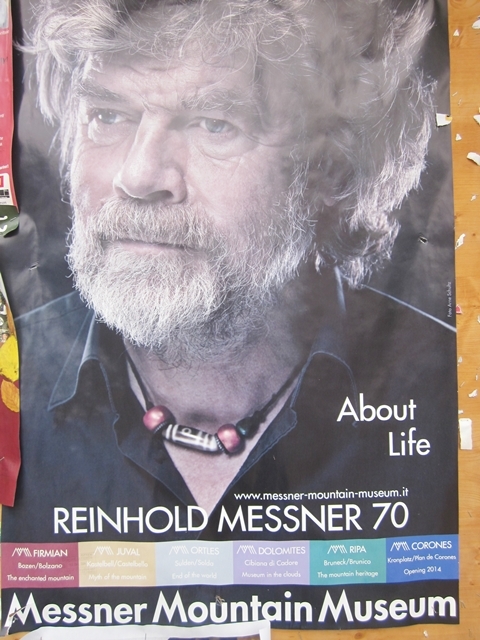 Born in 1944 (I guess that’s why the poster says “Reihold Messner 70) he started climbing mountains at the age of five and has been one of the world’s most outstanding mountaineers for thirty years. In his over three thousand climbs he has achieved over a hundred first ascents, and was the first to climb all of the world”s 8000-metre peaks. Messner was the first to reach Mount Everest”s top without oxygen support. He has crossed by foot the Antarctic, Greenland, Tibet, the deserts Gobi and Takla Makan. He started climbing mountains at the age of five and has been one of the world’s most outstanding mountaineers for thirty years. In his over three thousand climbs he has achieved over a hundred first ascents, and was the first to climb all of the world”s 8000-metre peaks. Messner was the first to reach Mount Everest”s top without oxygen support. He has crossed by foot the Antarctic, Greenland, Tibet, the deserts Gobi and Takla Makan. Up to 1970 Reinhold Messner had made a name for himself mainly through his achievements in the Alps. Between 1950 and 1964, he led over 500 ascents, most of them in the Dolomites. Because of severe frostbite, especially on his feet—six toes were amputated. Messner was not able to climb quite as well on rock after a 1970 expedition. He therefore turned his attention to higher mountains, where there was much more ice. 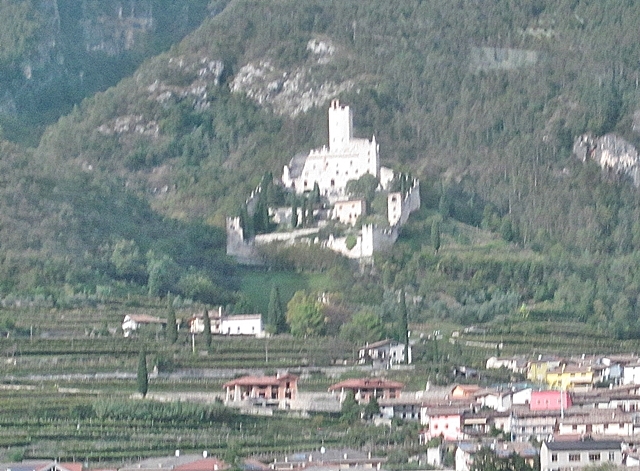 The Messner Mountain Museum (MMM) founded by Messmer is based in Sigmundskron Castle near Bolzano. 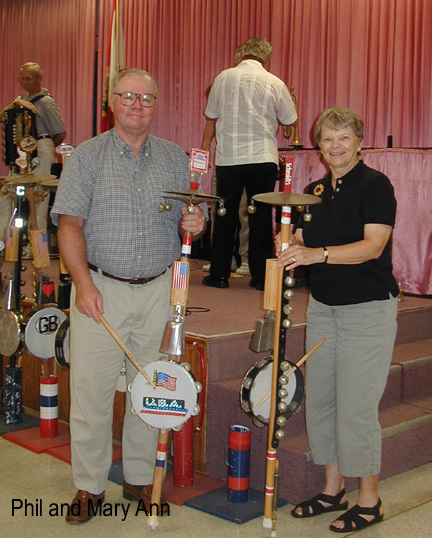 On 11 June 2006 the Museum opened. 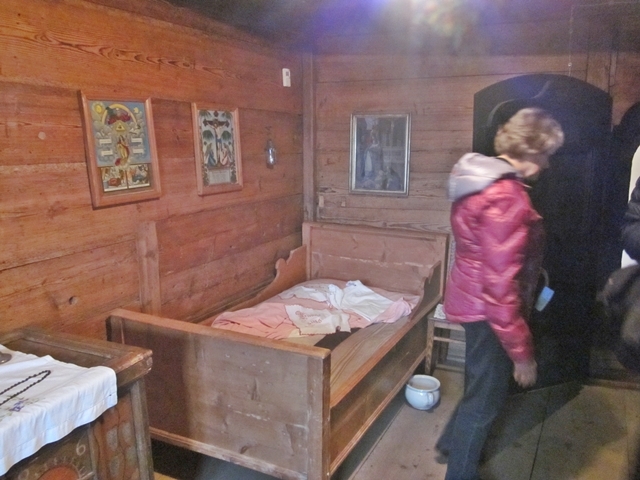 It is a museum that unites within one museum the stories of the growth and decline of mountain expeditions and the culture in the Himalayan region and the history of South Tyrol. We never got to the museum, but I recalled reading most of his books in my younger mountain climbing days in the White Mountains and Adirondacks. I was telling some of our fellow tourists that Messner had lost some fingers due to frost bite. I was wrong – he lost 6 toes because of severe frostbite on an expedition to Nanga Parbat (located in the northern area of Pakistan. It is the nineth highest mountain in the world and the second highest ,after the 1970 expedition. He therefore turned his attention to higher mountains, where there was much more ice. He was one of my heros and it was great to see his face on a poster showing that he was still around. We stopped by a church and small cemetery in Collabo. 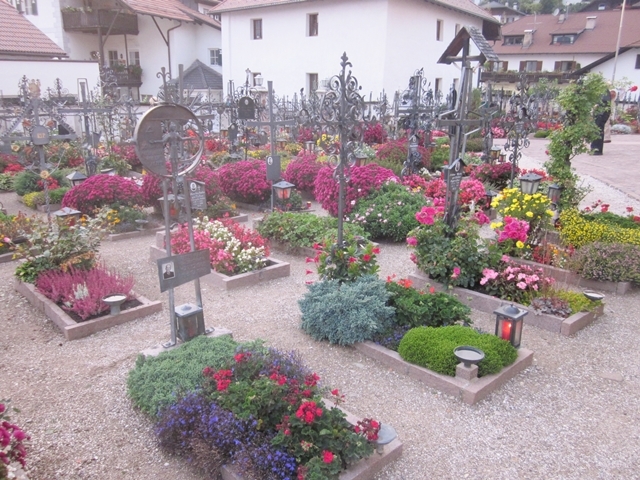 The interior of the church was beautiful and the cemetery was quite unusual: All the plots were covered with flowers and the markers had pictures of the occupants. 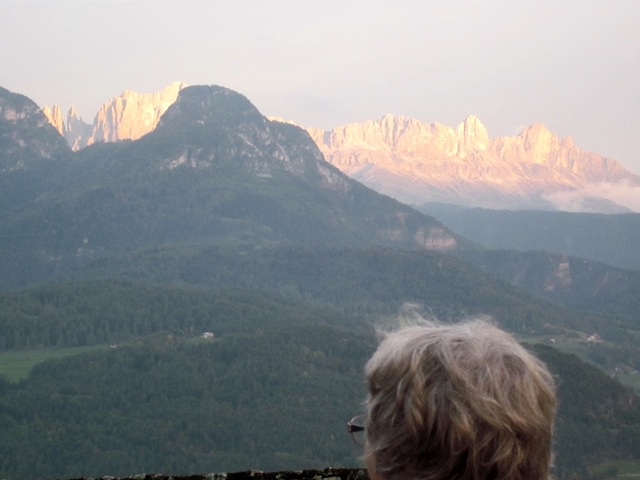 It was near the church that we got our first view of the Dolomite Mountains. It was approaching sunset and the mountains were bathed in the evening sun. It was stunning! 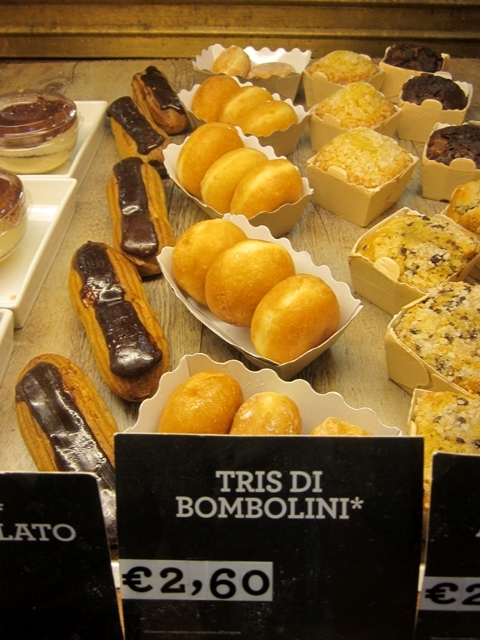 Just what we were hoping to see on this Italian tour!! In the distance are the Catinaccio peaks (9780 feet). They are mainly composed of calcium carbonate and magnesium. That’s why they “glow”. We stared at the vista for a while and then rejoined the group. Mary Ann and I planned to hike around here tomorrow and see some more views. We drove down from the Renon Mountain on a long winding road that had so many switch backs that they were numbered. 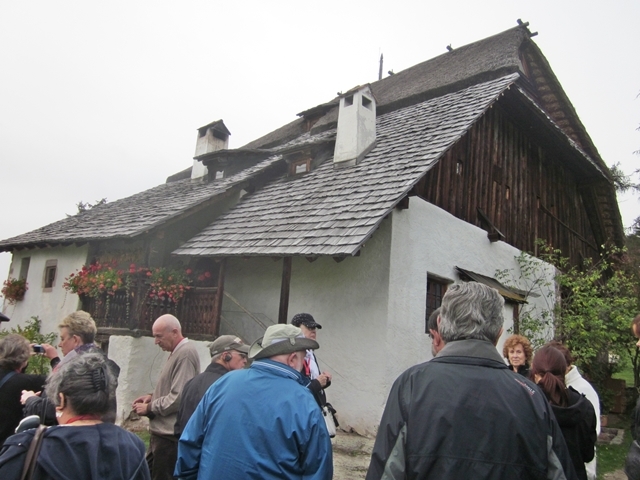 We stopped at a “Apiary/Honey Museum” in a little mountain village. It was owned for 60+ years by the two Plattner sisters (B+W pic above). The building is over 600 years old. It was dilapidated and abandoned when the museum took over. We entered through the sisters living quarters at the lower level. Note the outhouse sticking out the back and the kitchen sink drain below the window. 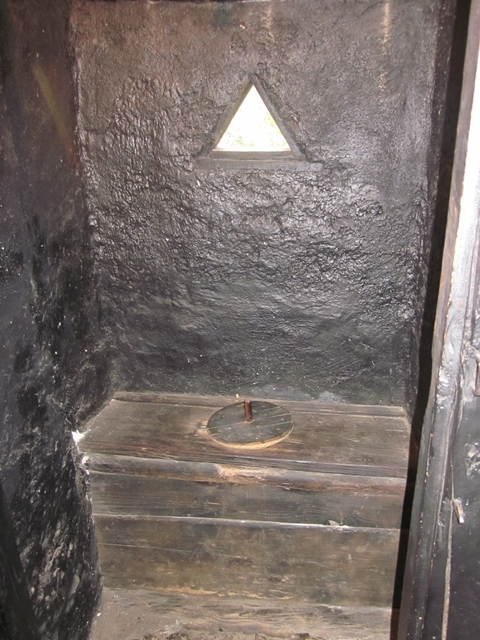 Here is what the kitchen and toilet look like from the inside. 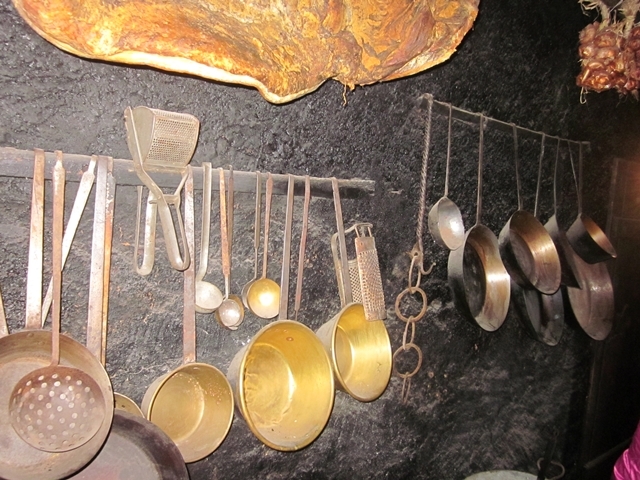 The sisters used their kitchen as a smoke house for curing meats. Over the years a thick layer of hardened stuff coated all the walls. It still smelled smoky. The top picture has a simulated piece of meat (bacon?) being smoked. Their dining and bed rooms were small, but not coated with meat smoke. 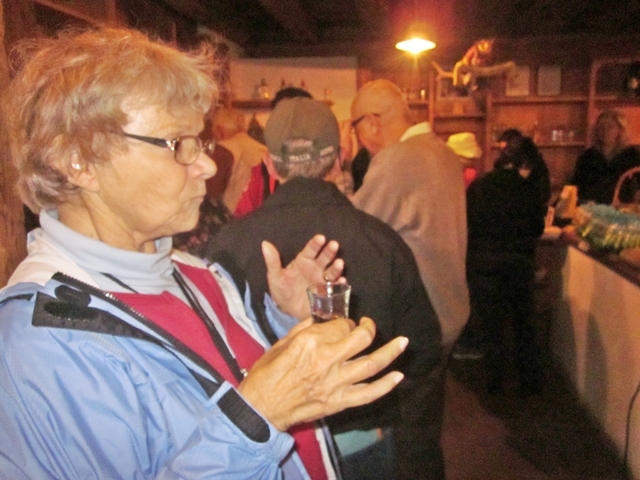 Upstairs in the old hay room was the “Honey Museum” the Honey Lady gave a talk on bees and honey production (sorry, I missed her name). 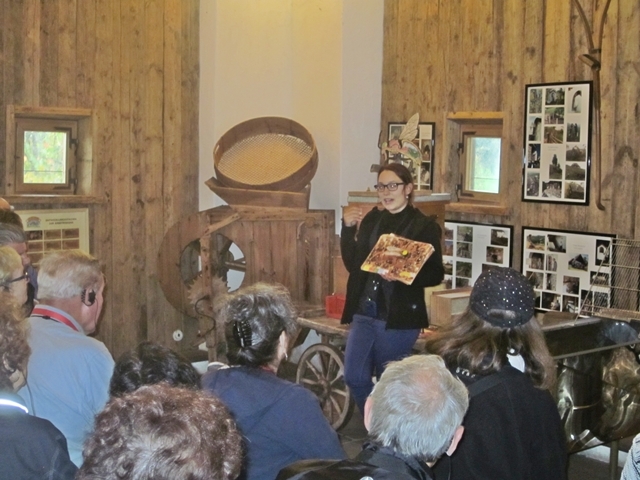 At the end of her talk, we all sampled many types of honey. They were all so sweet we had to buy some honey candies. We were serenaded by two local kids. 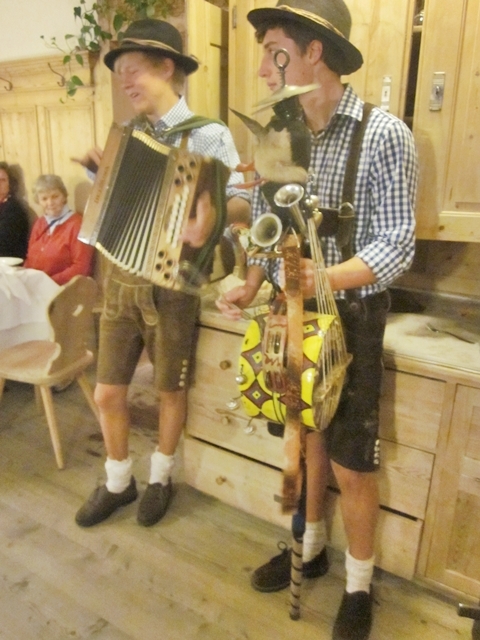 One on the accordion and the other playing what they called “The Devils Violin” . 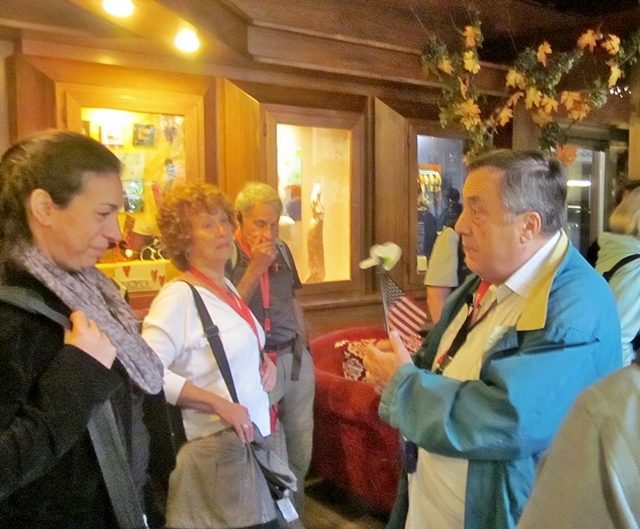 After a nice dinner, we were bussed back to our hotel for the night. So endeth our trip to Renon Mountain.